Rand Paul, Joe Sestak Hit By Errant Ads: PolitiFact : It's All Politics Both Dr. Rand Paul and Rep. Joe Sestak, Senate candidates, were victimized by truth-bending TV ads. PoliFact found the ads used the common technique of distorting an element of truth. Bill Adair, editor of PolitiFact.com, talked with All Things Considered co-host Melissa Block about what his truth-squadding team found when they examined some of recent political ads. As is typically the case, the common theme in the ads was that they took some grain of truth and distorted it. For instance, there was the TV ad out of the U.S. Senate race in Kentucky. 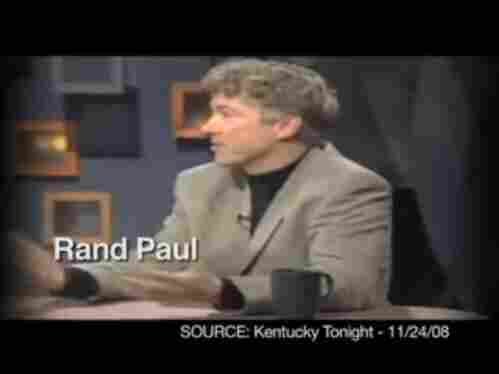 The ad for Democrat Jack Conway accuses Rand Paul, the Republican nominee, of being soft on crime and attempts to buttress the charge with a snippet from a Paul TV appearance edited so that there's no context. ADAIR: It’s a classic case of taking Rand Paul’s words out of context. He was referring at the time to helmet laws and gambling. He was not referring to drug dealing or theft or burglary or prostitution. MELISSA: When he’s talking about things that are not violent, that shouldn’t be against the law. ADAIR: Exactly. And its one of the bigger distortions that we’ve seen so far, particularly in this case coming from a Democrat in Kentucky. So we rated this false on our truth-o-meter. Another truth-bending TV ad hailed from the Pennsylvania Senate race and was directed against Rep. Joe Sestak. The ad paid for by Crossroads GPS, a political group associated with Republican political strategist Karl Rove, accused Democratic Rep. Joe Sestak of "gutting Medicare." Adair: We rated that barely true on the Truth-O-Meter. Specifically, we were looking at 'Did Sestak truly vote to gut Medicare? The number’s right. That’s the number of seniors in Pennsylvania who get Medicare Advantage, which is a certain type of Medicare program which offers extra benefits. Under the health-care reform law that Sestak voted for, there are probably going to be some cuts in Medicare Advantage but only to its extra benefits, things like vision care, not to the core program. So that one got a barely true on our Truth-O-Meter. NPR and PolitiFact.com are working together this year on The Message Machine. We’re fact-checking what candidates and interest groups are saying in their ads. You can read about the ads – and see many of them – on The Message Machine page.